Sure, I should've taken videos of them doing these back when they were younger and actually did them to play with each other and friends. It would've been cuter. Now, in 6th and 8th grade, they're generally too old, though we have been known to break out a little family hand jive while waiting on line with nothing else to do. Even Anthony gets in the act, sometimes, usually with disastrous results. ...and then they alternate dipping down, one, then the other, then both together, until somebody makes a mistake. ...and then they jump out each time, till somebody can't go any further. As the more competitive gymnast who can do the splits, clearly Pippa will win this one. Anthony has never tried he, nor will he. This one makes little to no sense. But it serves two purposes. It's one of those speed games that lets kids slap each other, if the other person doesn't move their hand away fast enough. And, like "Eenie meenie miny mo," this game is sometimes used to pick the person who's "It" for a game. And, as with "Eenie meenie miny mo" it's much fairer (and harder to premeditate) when there are more than two kids. If you've ever heard the phrase "jeu de paume", which literally translates as "palm game", you might think that's what they are called. Jeu de paume is a museum, a hotel, an alley name, and even a famous historical oath taken on the eve of the French Revolution. It's also a hand game that's been played for over a millennium. But it's a different kind of hand game -- a hand-ball game, in fact, considered the precursor not only to handball, pelote, and jai alai, but also to tennis, badminton, racquetball, squash, ping pong, etc. These little chants that kids sing out are known as "comptines" (literally "little tales" though "little songs" or "little games" might be more accurate). 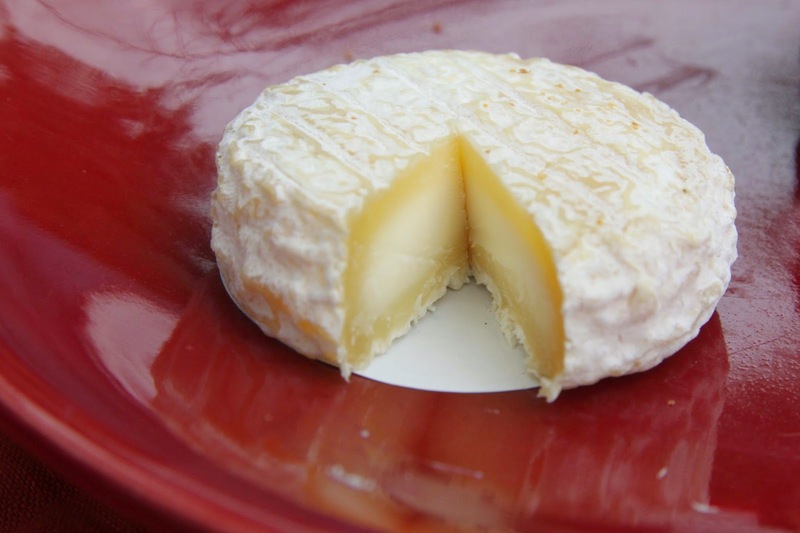 Picodon de Serre is one of the many kinds of Picodons -- variations on a theme, made from raw goats' milk. This Picodon de Serre has been made for the past seven years by Etoile du Vercors from the milk from their troupe of 50 Chamoise goats. They are fed, according to AOC regulations, with barley and hay gathered from the Ardèche plateaus and Drôme. It's a tiny disc that easily fits in the palm of my hand. The Picodon cheeses may be small, but they have a large flavor -- a wonderful creamy, dry, crumbly texture that melts in the mouth and hints of grasses and flowers. They can be served younger and fresher, but in general you'll find them aged and nearly rock-hard (on the outside), so that they can be transported. The Picodon de Serre is a fine representative of the Picodon family, though not as famous as its sisters from Ardèche and Drôme. "Serre" is not only the area where this hand-ball-sized and shaped Picodon is made but, in an unrelated meaning, is also the conjugated form of the verb "serrer", meaning to grasp hands. So there's that relation. And though this comptine is not a hand game, it is the kind of song that little kids sing and play to in the recess yard throughout France.